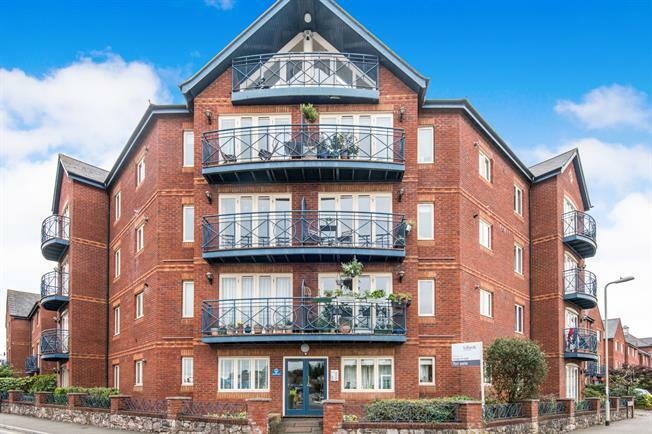 2 Bedroom Flat For Sale in Exeter for Offers in excess of £220,000. An early viewing is highly recommended to make the most of this two bedroom apartment situated in a desired area. Accommodation comprises a spacious lounge/dining area with a balcony providing views across the Quayside, separate kitchen, two bedrooms with an en-suite shower room to the master bedroom and a family bathroom. The apartment is in good decorative order through out and benefits from gas central heating, double glazing and one allocated parking space. An early viewing is highly recommended. Wooden double glazed window to the rear aspect, radiator, carpeted flooring. A white three piece suite comprising pedestal hand wash basin, low level WC and bath with shower head and mixer taps over. Radiator, part tiled surround, extractor fan. A fitted kitchen comprising a range of matching wall and base units. Wooden double glazed window to the front aspect providing views across the Quay and boat yard. Stainless steel sink with drainer and mixer tap over, space for washing machine. Integrated oven and inset four ring gas hob, integrated fridge freezer. Part tiled surround, vinyl flooring. A three piece suite comprising shower cubicle, low level WC and hand wash basin. Part tiled surround, vinyl flooring. To the rear of the property you will find one allocated parking space.